This site is aimed at generating enquiries and providing a showcase for the capabilities of a local building firm. 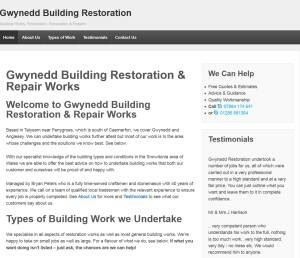 The site utilises WordPress with a responsive, search engine optimised template. As well as web design and hosting we also provided copy writing services. 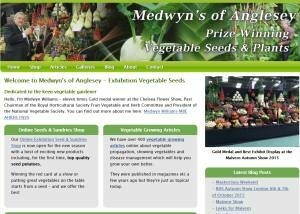 Medwyn Williams is one of the most respected growers in the world, with RHS Chelsea gold medals etc. The site provides information to benefit vegetable growers with articles, a photograph gallery and blog. It also sells selected seeds, plants and accessories. The site utilises a WordPress blog, bespoke scripting to a content management system for the galleries and article archive along with a CubeCart shopping system installation. We provide design and hosting services. 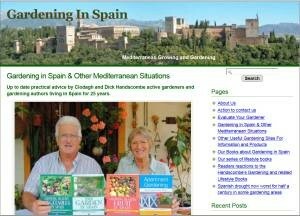 This site showcases Spain-based gardening author, Richard Handscombe and promotes his books whilst providing information for those gardening in Spain. 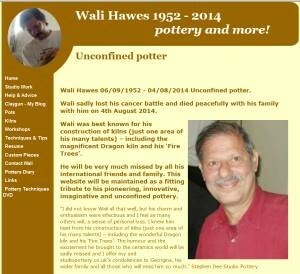 This site was designed some years ago for a friend who was an internationally recognised, innovative ceramic artist. It was due for a redesign which had been discussed in concept. Sadly Wali contracted cancer and died in 2014. The site is maintained as a tribute to an immensely talented artist and a good friend who is greatly missed.